You walk in to your horse’s pen with his evening feed and instead of coming to you he stands off in the corner and paws the ground. For most of us this creates an immediate fear reaction. Oh my God, my horse has colic. But then, after taking a deep breath, you regroup. 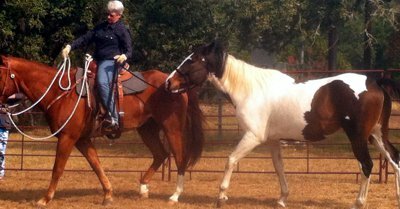 Your horse is on a holistic management program, he gets daily prebiotics and he lives a natural lifestyle. He is not likely to colic under these conditions. Sure enough you check and he has good gut sounds and normal manure in the pen. So what else could his symptoms be telling you? Before you launch into your homeopathic colic remedies or reach for the Banamine, you want to make sure you are really treating colic. There are other possibilities to consider. A mare with painful ovary can present like colic. The cramping pain can cause her to paw the ground and move painfully. Most of the time a mare will still eat if the food is brought to her. Carefully palpating her flank region will tell you that she has pain in an ovary. Ask yourself if your mare has been in heat or is due to come in. Ovary pain can respond well to homeopathic remedies or Banamine but you will also want to evaluate her management program to help balance her hormones. I like RelaxHer or Relax Blend as a gentle herbal mix to balance hormones. Some mares will need a deeper approach such as acupuncture or a constitutional homeopathic plan. We don’t often think of kidney stones in horses but they do get them. A kidney stone can present like colic. The horse will paw and may even get down and roll. Ask yourself if your horse has shown any signs of difficult urination. Maybe he has needed to stop and urinate more frequently than normal or has stretched out and strained for some time before his urine passed. Swelling over the lower back on one or both sides of the spine is a sign of kidney congestion. If your horse has a stone it can be very painful when this area is palpated. If possible, try to get a sample of his urine for evaluation. An ultrasound exam will help rule out a kidney stone. Musculo skeletal pain can present like colic. Tying up is one example, but this usually occurs after riding. A severe stone bruise, hoof abscess or arthritic joint can cause enough pain to affect your horse’s appetite and willingness to move. Ask yourself if your horse has been worked on rocky ground or if the weather has changed abruptly to cause a flare up in arthritis. Another more ominous musculo skeletal condition to consider is laminitis. Acute laminitis can present like colic. Ask yourself if your horse has had access to lush green grass or some high protein food in the pasture such as acorns or mesquite beans. Don’t panic if you think it is laminitis. Laminitis can respond quickly to good holistic care. Check out our Laminitis, Cushings and Insulin Resistance e book for a plan on how to avoid or manage these conditions. So remember what looks like colic is not always colic. Be prepared to explore what other conditions could be happening with your horse so you don’t waste any time or energy with an incorrect diagnosis. Remember a horse on a holistic management program is much less likely to develop digestive problems. Holistic Horsekeeping is a handbook on holistic care and a good place to start if you are wanting a holistic management plan for your horse.